The American Cocker Spaniel is the smallest member of the sporting-dog family. The sweetest temperament and the smallest of gundogs, the American Cocker Spaniel has a short, firm body with a deep chest; sholders that slope slightly from withers to loin, a wide distinctly domed head with clearly refined stop, an angulam muzzle, long low-set pendant ears. Round, full dark brown eyes, and tail customarly docked. It's straight or slightly wavy coat is fairly short on the head, but quite full on the ears, chest abdomen and limbs. Coloring includes black, other solid colors and parti-color. Not to be confused with the English Cocker Spaniel which has a different conformation (see below for more information), but could be confused for the novice eye. The American Cocker Spaniel has been exhibited in the United States since the early 1880s. It is known simply as the Cocker Spaniel in the U.S., other counties refer to it American Cocker Spaniel, while they the English Cocker Spaniel just "Cocker Spaniel" everywhere exept in the U.S. .
History: This breed was created by crossing setter and spaniels. During the seventeenth century, it was divided into water and land spaniels, the latter group futher being divided into big and small spaniels. Further selections from the smallest ones created cockers and toy dogs. Again, the cocker spaniel is considered the smallest of the sporting breeds; its name comes from its superb ability to ferret out woodcocks. Introduced from England to the United States between 1870 and 1880, the American Slowly evolved into a distinct breed that is extremely good at flushing and retrieving small game birds, especially quail. England developed a different kind of Cocker Spaniel recognized as the English Cocker Spaniel. Free spirit exptremely cheerful, speedy, an untiring hunter and a companion always eager to please its master, this breed is also charmingly delicate, loving and gentle with children. Nowadays Am. Cocker Spaniels more popular in the show ring than in the field. But from any point you see them Cocker Spaniels make wonderful family pets and companions. 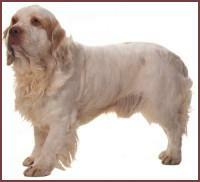 This breed developed in England after the Cocker Spaniel came to America and followed a different course here. The English Cocker is a bit larger and a bit more houndlike in the head, having a longer muzzle than his American cousin, and is considerably less popular in the US. This breed was ranked 67th of 133 AKC breeds, with only 1499 individuals and 471 litters registered in 1991. The English Cocker is as sweet, loyal, and happy as his American cousin, and, because he is less sought after, he has not been subjected to unscrupulous puppy mill and backyard breeding. His major differences are his size--he can be up to two inches taller and six pounds heavier than the American Cocker--and the shape of his head. He may also carry less coat than the American cockers bred for show. Colors are the same, as are temperament and level of activity of well-bred American Cockers. Cocker Spaniels are one of America's favorite pure-bred dogs. Before choosing a Cocker Spaniel for a companion please read up on the breed and make sure that a Cocker is the dog for you. A cocker puppy is one of the most adorable puppies but they grow up and need lots of attention. They love to be in the house with their family and if you don't want a house dog, a cocker would not be a good choice. They need a gentle loving master that is firm and consistant. Their coat requires special attention and they should have a good brushing at least once a week and their ears should be cleaned weekly. They also need frequent bathing and clipping. If you know that you can make all the requirement for a cocker then they could be the dog for you. They are a very devoted sweet little dog and a joy to have around. Cocker Spaniels must be well socialized at an early age, otherwise they could grow up to be shy dogs. And above all, if you do decide to get a Cocker Spaniel, make sure you get your puppy from a responsable breeder, puppy mills puppies that are sold in puppy shops can have many health and behavioral problems, puppy mill breeders (aka backyard breeders), aren't responsable for their dogs, they just breed them to make money, without putting into concideration their dog's health above all. Below are some examples of some of the color varieties of the American Cocker Spaniel. Black, Buff, Chocolate & Tan, Tri-Parti, Red Parti and Black Patri. An American Cocker Spaniel (left) and an English Cocker Spaniel (right). Other distant relatives of the American Cocker Spaniel.